While more than 50% of women have quit the engineering sector since 2015 due to men's attitudes, these two women are determined to continue breaking the norms and defying the odds. Earlier this year, Huffington Post reported that many women engineers have left the industry because of the gender-bias they experienced. But this is not the case for Lusanda Tyebileyo, 32, and Lerato Kotane, 30, who are becoming symbols of change in their profession. In fact, considering that only 11% of civil engineers in South Africa are women, and that even fewer of these are black women, Tyebileyo and Kotane possess remarkable fortitude in their determination to succeed. 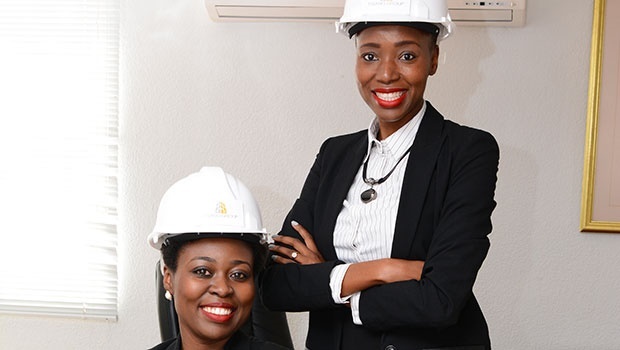 The two woman are also the founders and direcors of the Tisang Group, a 100% black woman owned general building and civil construction company. My thinking has always been ‘I can do what boys can do’ so the fact that engineering is a male dominated profession didn’t daunt me. Engineering is a tough profession for any one. “In my first year of engineering, a lecturer told the class: ‘Only one in two of you will graduate’,” recalls Tyebileyo. And so Tyebileyo pursued her dream at Wits University. It was here that she met her entrepreneurial partner, Kotane. Kotane admits that she considered a career in fashion design or architecture before settling on engineering. “The fact that I had such good grades in Maths and Science led my parents to question my initial career choice,” says Kotane. “Till this day I am grateful for their guidance, I would not trade these past 10 years for anything, nothing excites me more than contributing towards transformation and being counted among the female engineers who can make an impact,” says Kotane. Fresh from university, Kotane had to fight to be taken seriously as a black woman in a white male dominated industry. She had to work harder than her male counterparts to prove herself and she had to report to less qualified or junior male counterparts. There’s a stigma that if you are a woman and black then the road is clear and that you will get to your destination quicker...But it doesn't work that way. “You still need to prove yourself,” adds Kotane. Kotane emphasises the importance of entrepreneurs having a support structure. “We have also aligned ourselves with seasoned female mentors and entrepreneurs, who have experience in the industry,” she says. Perseverance is also key and pays off. After a lot of hard work and resolute determination in the face of rejections and “no’s”, Tisang Group landed several projects within the power and renewable energy space. Despite their growing success, the entrepreneurs admit that they need to continue to improve their financial management. They are not alone – poor financial management is a key factor behind the high failure rate amount South Africa’s Small and Medium Enterprises (SMEs) . It is for this reason that Kotane and Tyebikyo approached the South African Institute of Chartered Accountants (SAICA), which is addressing this phenomenon by helping SMEs with crucial back office accounting support and financial literacy training. The programme focuses on two challenges in South Africa: providing relevant work experience and skills to unemployed graduates and addressing the high failure rate of SMEs, through providing internal controls, risks management and reporting. The project has assisted over 120 SMEs since 2012. As a 100% black owned civil engineering business, we applaud the guts of the two female directors in entering a male dominated market. To be eligible to enter the SAICA J.P. Morgan flagship programme, SMEs have to go through a rigorous assessment process and pitch session prior to their participation to the programme being approved. So what sterling qualities did the selection panel see in the Tisang Group? “As a 100% black owned civil engineering business, we applaud the guts of the two female directors in entering a male dominated market,” adds Nombembe. Kotane is also grateful for their guidance: "I would not trade these past 10 years for anything; nothing excites me more than contributing towards transformation and being counted among the female engineers who can make an impact,” she says. These two women are no doubt great role models. They have acquired significant experience in their individual career paths and are working on high risk projects such as the Kusile Power Station, the fourth largest coal-fired power station in the world and contributing to new power generation in South Africa. And, more importantly, they are creating jobs and making a difference in people’s lives. This article is a Press Release from Terra Nova.